Wednesday March 11th 1896 Seth went to the timber. Will walked in town before noon. He brought a letter from Ott with out pass to go to Des Moines. I was busy sewing what spare time I had. weather quite cold. Thursday March 12th 1896 I did baking and got early dinner. Seth was gone to the timber.Will and I went down town after doing some shopping I went over the river. Aunt Ellen and Uncle Jim were there. We came home early. 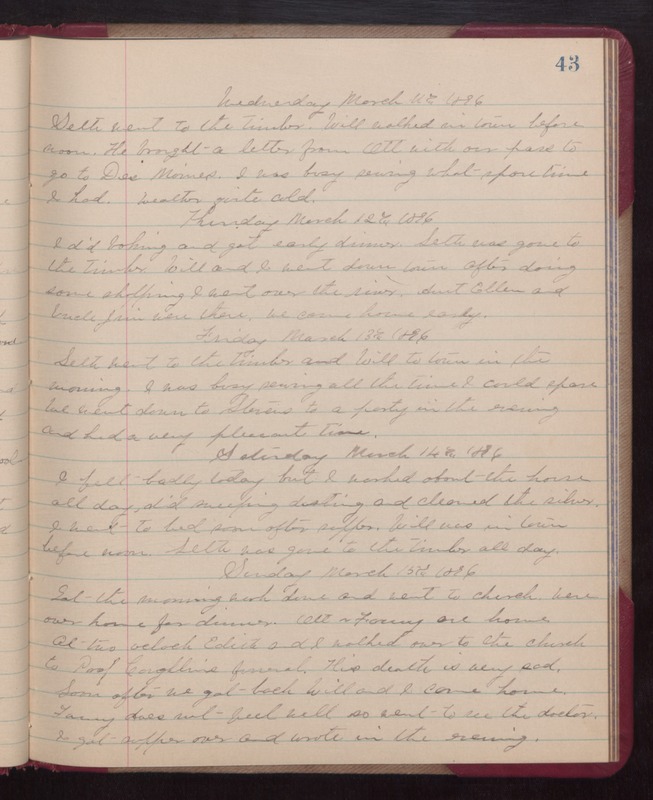 Friday March 13th 1896 Seth went to the timber and Will to town in the morning. I was buys sewing all the time I could spare. We went down to Stevens to a party in the evening and had a very pleasant time. Saturday March 14th 1896 I felt badly today but I worked about the house all day, did sweeping, dusting and cleaned the silver. I went to bed soon after supper. Will was in town before noon. Seth was gone to the timber all day. Sunday March 15th 1896 Got the morning work down and went to church. were over home for dinner. Ott & Fanny are home. At two oclock Edith and I walked over to the church to Prof Coughlins funeral. His death was very sad. Soon after we got back Will and I came home. Fanny does not feel well so went to see the doctor. I got supper over and wrote in the evening.